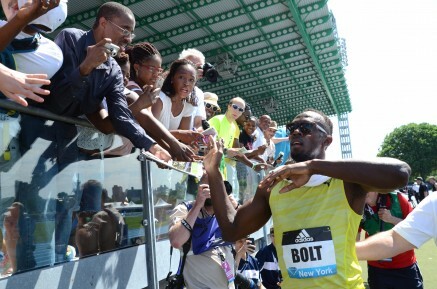 14th June 2015 – For the first time back at the scene of his 2008 100m World Record, Usain Bolt (JAM) took victory over 200m on this occasion at the latest leg of the IAAF Diamond in New York. After the race Usain was heavily critical of himself saying he did not get a good start and “ran the worse bend of his life” but he still did enough to win the race in 20.29 seconds while running into a stiff head wind. World Championship 1500m silver medalist Matthew Centrowitz (USA) stepped down to the 800m here and smashed his PB by over a second to take fourth position in 1:44.62. Commonwealth 10,000m champion Moses Kipsiro (UGA) made a welcome return to the track taking fifth place in the 5000m in a hotly contested last lap kick. Mary Cain (USA) finished fourth in the 1000m and Schillonie Calvert (JAM) sixth in the 100m. At the IAAF World Challenge meeting in Rabat, Vivian Cheruiyot (KEN) showed she is continuing to progress with another solid run of 8:39.75 for second place in the 3000m. Shannon Rowbury (USA) had a good workout when running both the 800m and 1500m at the Portland Track Festival. She took second in the 800m in 2:00.53 and then third in the 1500m in 4:07.52. In London, Jemma Simpson (GBR) took second place in the Amba Hotels Road Mile event and Tom Lancashire (GBR) was third in the mens race. One day earlier Tom won a 1500m in Ireland in 3:40.